This past week, Sister Pat Haley attended the 50th-anniversary gathering of the National Black Sisters’ Conference (NBSC) in New Orleans, Louisiana. The NBSC was founded in 1968 in Pittsburgh, Pennsylvania. Sister Martin de Porres Grey, RSM (now Patricia Grey, Ph.D.), with the support of the Bishop of Pittsburgh and the Pittsburgh Sisters of Mercy, called black religious women to gather and work together, fully free, and joyously for the coming of the kingdom. 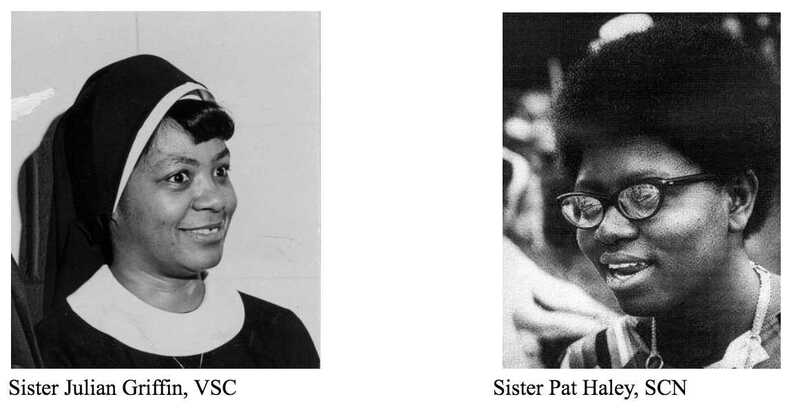 The founding mothers of the NBSC include Sisters Julian Griffin, VSC, and Pat Haley, SCN. Sister Julian Griffin, VSC, was born and raised in Columbus, Georgia, in a strong Baptist family. She was taught by the Vincentian Sisters of Charity at Mother Mary Mission in Phenix City, Alabama, and converted to Catholicism at age 15. She was the first African-American member of the VSCs when she entered the congregation in 1962. During her career in education and social work Sister Julian served in Montgomery, AL and Savannah, GA. In Savannah, she helped establish the Westside Comprehensive Health Center and founded the Black Catholic Council and the Costal Empire Center for Research. Sister Julian Griffin died at the age of 42 as a result of complications from colon cancer. Sister Patricia “Pat” Haley was born in Columbus, GA. Sister Pat first met the SCNs when she attended Holy Family High School in Ensley, AL. As a senior in May 1963, she became involved in the Civil Rights movement and was arrested and jailed for participating in the Birmingham youth marches. In September 1963, she entered the novitiate of the Sisters of Charity of Nazareth as the congregation’s first African American postulant. Sister Pat was also the first African American Sister to serve in the Archdiocese of Louisville. She spent eighteen years ministering in Philadelphia, served as coordinator of the Spiritual Enrichment Program for the Institute of Black Catholic Studies at Xavier University in New Orleans, and continued her ministry in St. Petersburg, Florida, before returning to Kentucky in 2011. Sister Julian and Sister Pat attended the first meeting of the NBSC in the summer of 1968. Over 150 black Catholic women religious from 79 different national and international congregations were present. Sister Martin de Porres was elected to serve as president. A board of directors, including Sisters Julian and Pat, was elected and plans for legal incorporation of the National Black Sisters’ Conference were made. Sister Julian, was my ninth grade History teacher at St Jude’s Educational Institute in Montgomery, Al. and the first Black Cleric any of us had seen. She took us into an awakening and acceptance of our status. We spoke of her fondly during our 50th Class Reunion (2018). Congratulations to all how have touched so many. Way to go Pat!!! I knew your were great all along. Blessings and may the Black Sisters Conference continue to be a bright light in our country. Now make music in a special way for these fifty years! Wow, Pat! How wonderful to hear of the 50 year effort to speak and to work for the African American church and for its priests and religious who have worked hard in service of that dynamic part of the church. So very proud that you were a part of this wonderful effort from the beginning! How proud and grateful we are, Pat, for your leadership in the Black Sisters Conference! Your life has graced our SCN Community. Sister Pat, Thank you for the gift you are in the Church, among us SCNs, and throughout our country, and beyond. You are an inspiration to me. Wishing you all continued blessings, with my love and prayer.